My mother warned me, before I got home, that Tally was walking lame. She’d just recently been trotting with the odd “oops” step, so I assumed that perhaps a hoof abscess might brewing. They can come on slowly, then they hit – wham! 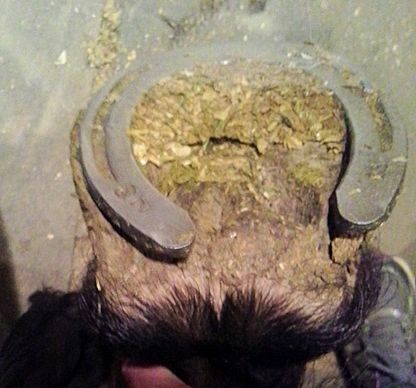 For the less horsey types – a horse’s hoof is hard on the outside, no doubt (take it from one who is still healing the damage done by one of those hard hooves). But, what most people don’t know is that under that relatively thin, very hard shell, is a mass of veins and nerves surrounding a couple of very small bones. Even a small abscess in that web of nerves can make a horse looked crippled. Innocent looking twisted shoe, with a hidden secret. So, when I got Tally out, she appeared to be a perfect example of an abscessed horse … gimping along nearly three-legged. When I picked her foot up to take a look, I noticed that her shoe was twisted to the side. 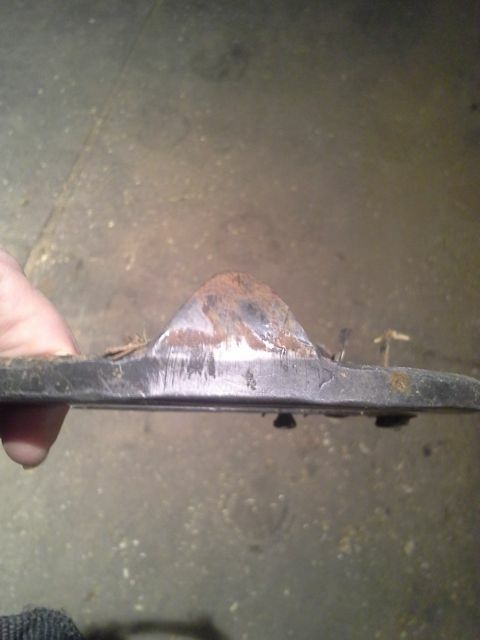 The shoe was sitting pretty flat, just canted off to one side. As I contemplated whether this could be the main cause of her problem, I set the foot down … and suddenly had a sickening realization – she had clips on her shoes! The clip that was embedded in her foot – viewed from the front of the shoe. The inside bend of the shoe was a good half an inch (or more) inside the wall of her hoof, yet it had been sitting completely flat on her sole. That meant only one thing – she had imbedded the shoe clip into her sole! I quickly snatched the foot up and confirmed this sickening realization. As my stomach twisted with empathic pain, I tried to think quickly about what tools I had. My mom ran for each thing as I called for it. I prayed the whole time that Tally would be patient and let me hold the foot. The thought of her stomping it down, with that metal jammed into the sensitive tissue, made my stomach churn harder. I tried to remove the shoe as gracefully as I could – but my tools and the light were inadequate for the job. As time dragged on, and I knew I was nearing the end of my mare’s patience, I finally just gave it a good yank. Not the prettiest result, but the shoe was off and she could put her foot down without further damage. The clip, viewed from the side of the shoe. 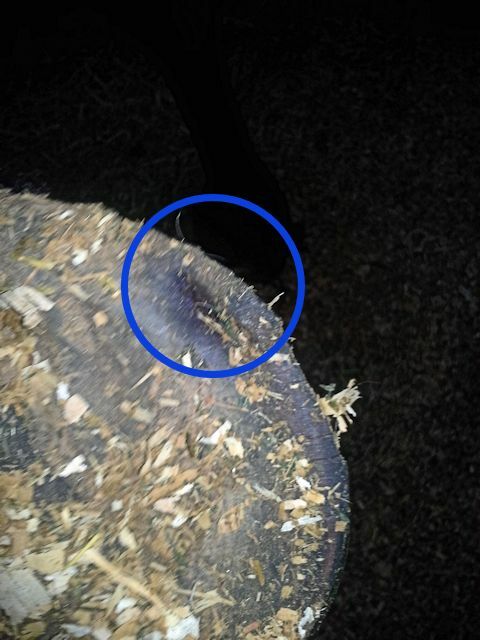 This photo does not do justice to the deep hole (circled), right in the most vulnerable part of the hoof. She walked away still sore, but far less painful than before. 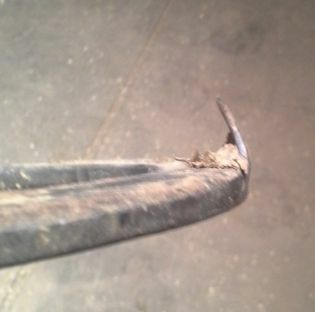 The hole left by the clip looks bad – but some disinfectant should minimize risk of infection, and a little anti-inflammatory will help ease the pain. Even as I write this, I continue to have little shivers of empathetic pain. I have no idea what “clever” thing she did to twist that shoe – yet I feel guilty just the same. So, she will receive lots of sympathy carrots and hand grazing … and love every minute of it, no doubt! This entry was posted in My Journey and tagged embedded clip, hoof, lame, shoe, Tally. Bookmark the permalink.